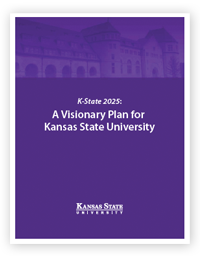 Realizing the vision of K-State 2025 requires holding ourselves accountable. Evaluating, reporting, communicating, and celebrating our progress are ways we do just that. To learn more about the latest news, activities, and accomplishments, see each thematic goal. For an annual snapshot of our accomplishments, read our progress reports. You will find our most recent report covering the first five years of K-State 2025 as well as our previous annual reports. 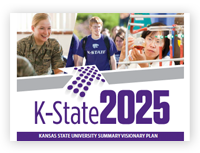 Additionally, K-State 2025 presentations from the annual fall visits of the President and Provost with colleges and major units are available as well as presentations of deans, vice presidents, and other unit leaders. Learn more about what is being done across the university as we work together to advance our strategic goals. For a quick overview of K-State’s most recent rankings as a public research university, see At A Glance: K-State 2025 Top 50 Public Research University Metrics and Most Recent Rankings (pdf).